I am here with Advanced version of SQL_Inj3ct0r. In this version I have added few more functionality to the tool. We will see what are these functionality in this post. This version of SQL_Inj3ct0r is having two more method by which you can exploit you target using SQL injection. 1. You will get this modules shown in the screenshot on first access of 'Advanced_injector.php'. You can download sqlmap here. if you already have sqlmap , simply set that's location using "Set" button. 2. If you download the sqlmap, SQL_Inject0r will show the location of sqlmap. Simply type the path in input box as shown and hit "Set". Refer screenshot below. 3. After setting the location you will be redirected to following main module where you get 4 options ( i.e 'GET Method' , 'POST Method' , 'Inject using file'), for injecting the target via 3 different method and one option for generating a file. If you want do changes on path/location of sqlmap, You may use "Reset SQLMAP path" button as shown in the screenshot. a) Injecting target using GET Method. you can set any value for 'Level'(from 1 to 5) and Risk( from 1-3). If you don't specify the value, SQL_Inject0r proceed for exploitation with their default values. For exploitation technique ( depending on SQL injection type ) you can choose any out of 5.
b) Injecting target using POST Method. After that, set Level and Risk, select your exploitation technique and hit "Exploit" button. Using this module you can generate a txt file which contains the request header. this file will be used to inject the target through "Inject using file" module. d) Inject target using file. In this module you can use the generated file to inject your target. Simply type the filename in text box, set level, risk, technique (if you wish to) and go for "Exploit". I am using 'sqli-audi lab' again to demonstrate the usage of the SQL_Inject0r_v2 as I used this for previous Inject0r. From 'Step2' complete exploitation process with be same for all of three the modules. Step1: Provide DB filename in text box and click on "Exploit" button. 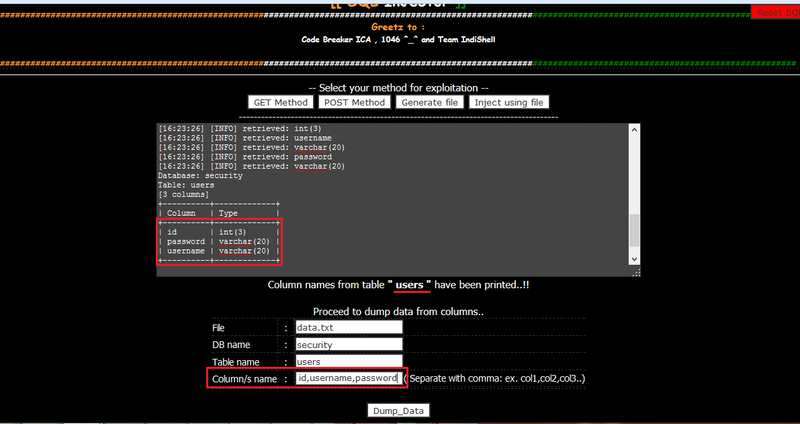 Step 4: After getting the columns name, you can proceed to dump the data from columns. Type columns name separating them with comma(,) to get the data inside the column and click on "Dump_Data". Step 5: Finally, you will get the data inside the columns. So this is the SQL_Inject0r_v2 with some more functionalities.